It’s emails like these that make me realize just how many ’67 Beetles hold a special place in their owners hearts. Bentley’s story echoes many, as the vintage Volkswagen is a very unique car with an emotional connection to the past. We will keep searching around the world to bring these tales to 1967beetle.com. It’s a labor of love. Hello to all the wonderful folks out there that read this. My name is Bentley Jay Perkins, proud owner of a leather-craft business run with my father and of course, an early 1967 Beetle! Let me begin by introducing you to a vehicle that has no doubt been named many times in her past, but I like to refer to her as ‘Fluffy’ or ‘Fluff’ for short. First registered in the UK on 24th April 1967. 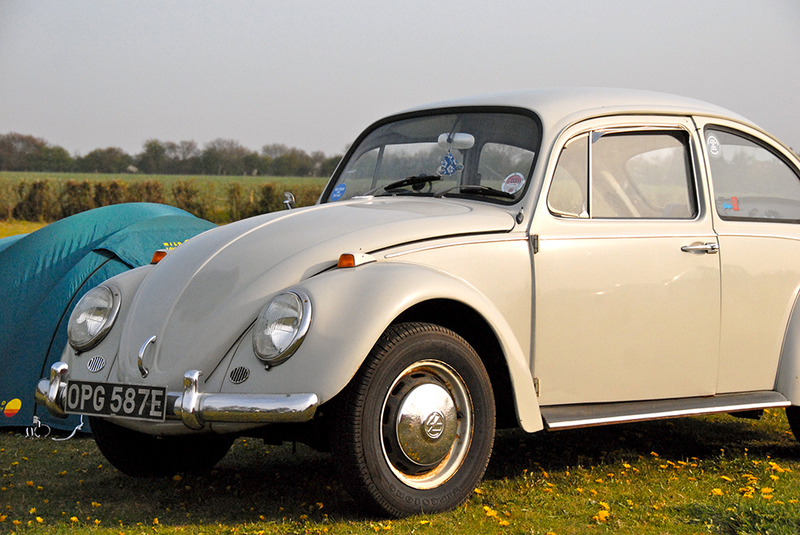 At the age of 17 I bought this wonderful example of a Beetle, having absolutely no knowledge as to how special the car I was purchasing was. Bought for the prize sum of £2050 with a last minute bid on Ebay I was in love immediately. Almost entirely original including her engine and paint she is now, from what I have been informed, worth a considerable amount more with the local Classic VW scene soaring and ’67 Split buses going for upwards of £25000 in mediocre condition I dare to even ask what this little bundle of joy is worth. (My insurance company would have a meltdown) So let the story of my past 8 years with her begin. Atttention! Boy does she get some attention! My first ever event that I attended was by suggestion of a colleague 2 years after the initial purchase. 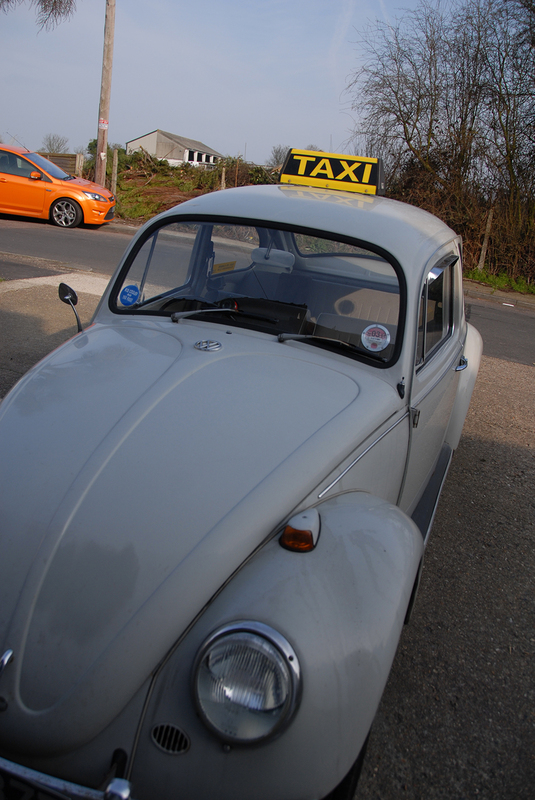 I bumbled in expecting to see lots of other Beetles just like mine…. only to find, none of them did. Yes they were all Beetles, but none of them had that character that mine had. She seemed a tad wider, longer and more sleek looking than the others, I had different catches, rear lights and other items of small detail I started to pick out. It was only until people started approaching my general area and asking if she was ’67 I realised something must be special about the year. Let the research begin! Since then I have attended plenty of shows, while not always with Fluffy, I have always asked around to gain peoples inside knowledge of my cars year, gathering, resourcing and researching I have found a ton of information is accessible to us one year only owners, like this website as a prime example! My latest crusade is the unfortunate need to re-spray the original paint. 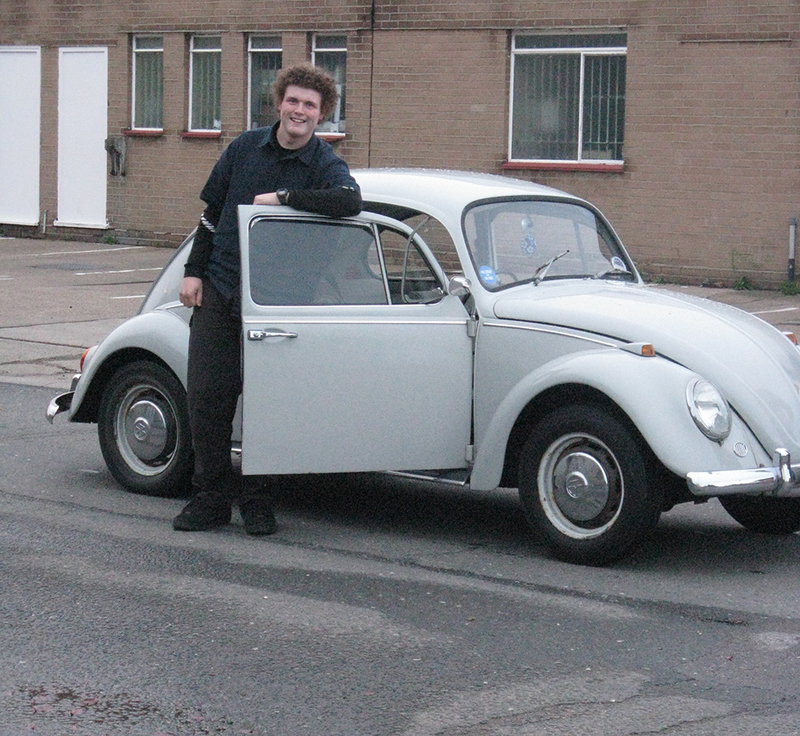 Enter stage left – Eric, Jay and Chris whom I have been conversing with to find the correct paint for my bug. While Eric has also prompted me to do this small write up for 1967beetle.com. ADVENTURES! Of how many do we speak? “Oh so very many” said Fluff, “oh so many!”. I think it is safe to say that this wonderful old girl has been far and wide across all possible cavernous and pot hole riddled roads the UK can throw at her. As a younger chap I was very keen on medieval re-enactment, 15th Century to be precise. This has led to trips from Sussex to Suffolk and beyond, most of the time the old girl has whistled along without a hitch full of heavy canvas, wool, wood, lumps of steel and all manner of other wonderfully heavy items we used. She has been inside castles the public can’t access, driven across beautiful lawns that are not even allowed to be walked on by punters and seen some of the finest English countryside the human eye can visualise! Slowly moving away from this hobby I have continued the camping, but in a lighter standing with modern equipment we still drove full to the roof, seats folded down and the bonnet filled! Brighton, Heddingham, Hastings, Epping to name a mere few! These adventures and stories are created even to this day as little Fluffy remains my daily driver. With 99,870 on the clock (I often wonder how many times that little clock has rolled over) and still running strong, it never ceases to amaze, bemuse and ponder my thoughts how hardy these fantastic cars are. They really are built to last! To Finish this small right up off I have uploaded a short video of her driving along the coastline in Brighton. I hope that you have enjoyed this light spell of sun, wind and waves with Fluffy! Thanks, Bentley, for sharing your story with 1967beetle.com. This is a most interesting ’67 Beetle. It is the Standard, rather than the Deluxe, Beetle. 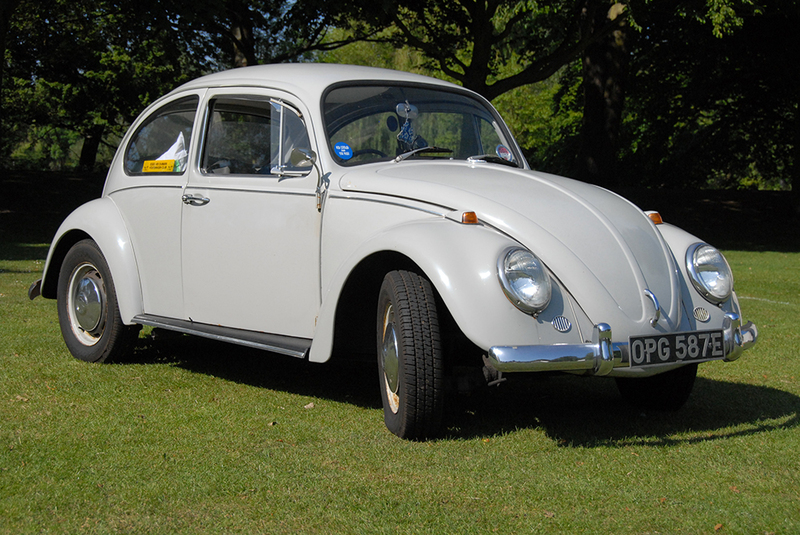 Eric–is it possible to post a photo of the interior of this Beetle showing the steering wheel and the door arm rests? Really like the euro bumpers. Nice 67″!! Thanks for sharing “Fluff” with us. A nice original Beetle! I believe (according to my monitor) that color is L595 Fontana Grey, which was available in the non-USA bound ’67 Beetles. A popular color for the Standards as well. I’m not 100% sure on the color. I’m thinking it is Pearl White. Hmmmm.. I believe i’m restoring ’67 very similar to Bentley’s. May i have his email add, if he doesn’t mind? I need to contact him on some key decision-making that would make or break the originality of the car. Many thanks in advance. Hiya Elango, If you fire an email to Eric he can fire that email add over to, I am sending him an email imminently and will give my express permission to give it to you. It’s interesting you should say this Jody as I was under the impression that it was Fontana grey myself, however it seems that it was only produced up until early ’66. Eric, Jay and Chris managed to use my engine code to decipher it down to being a very faded and worn Lotus white. Are those the correct headlights for 67 ? Earl, I think they would be correct for a non-US Beetle. Thanks! I know mine has the upright units so thanks for the explanation. Great story! Great Vdub. Thanks for sharing. Thanks Jeff! Thankfully the only manufacturer of the correct paint code in the UK is Guasprit which do a 2pak old fashioned style paint and whom i believe to be the original colour producers in Germany when my car was built. I wouldn’t want that ultra modern gloss myself, it always takes the character out of the car for me.